Bob Klein in chi-gung posture. I am putting together a dvd series on How to Teach Tai-chi. It will focus on the basic principles of Tai-chi form practice and how to convey those principles to the students. 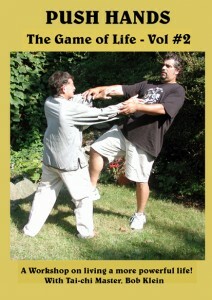 While someone may be skilled at a Tai-chi form, they may not be aware of the issues of teaching. 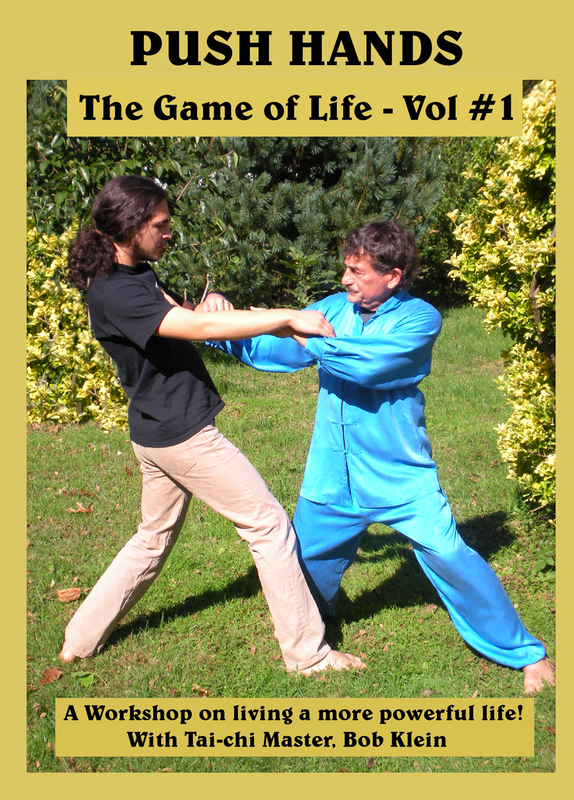 I think this series will be helpful and may inspire people to dedicate themselves to teaching Tai-chi. 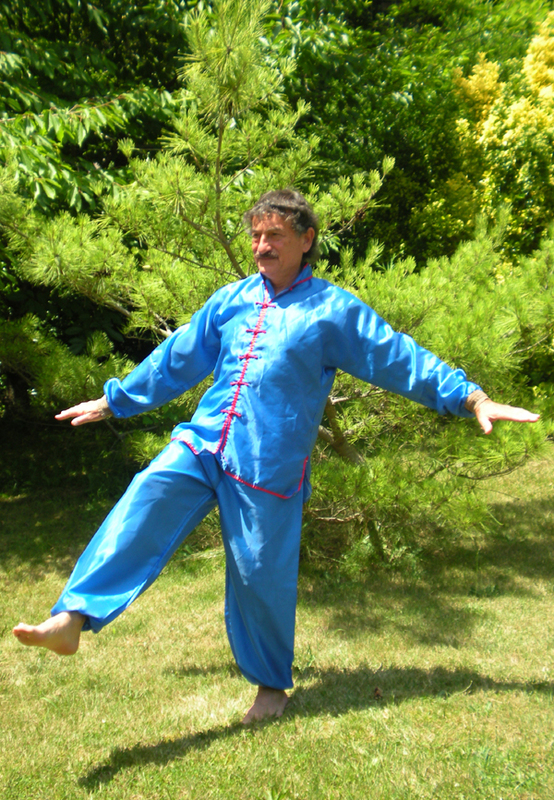 I like to say, “I’ve been around the block a few times”, meaning that at 64 years old and teaching for almost 40 years, I have become familiar with how to express Tai-chi to students in a way they can grasp and to appreciate their difficulties in learning. First of all, each student comes to the class with his or her load of tensions, misalignments, emotional fears and mental programming. 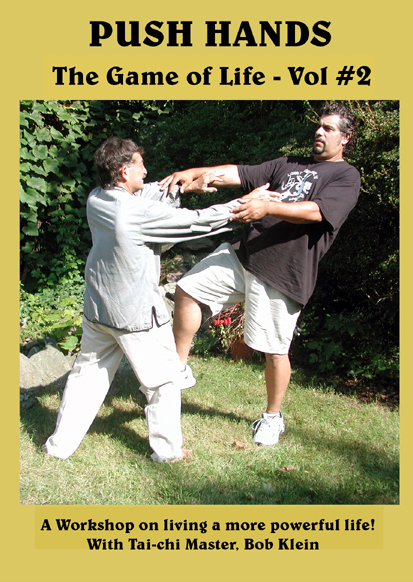 Tai-chi has to be taught to each individual differently, considering what they come in with. The teacher must develop methods to become aware of the state of the student in order to fashion a teaching approach for that student. When you are teaching a group class and are correcting postures, for example, you have to remember what approach you are taking with each student as you move from one to the other. It is like playing multiple games of chess. You can’t make too many corrections at one time because the student will become frustrated and won’t remember what you did anyway. So you have to stick with a theme of correction (e.g. “relax the hips”) throughout the class, for that student. You realize that the real benefit of Tai-chi training is not memorizing a form or chi-gung set, but that the student has worked through all of his or her issues, whether physical, mental or emotional and come out as a truly free and powerful individual. That is what the teacher should be going for, not just to teach people to memorize yet another thing. The teacher must know how each principle of Tai-chi achieves that. While all the students will arrive at that same free, powerful state, they are each taking different paths through Tai-chi training. If you force them to take only the path you yourself learned, then they will never really learn. And so you not only have to learn chi-gung, forms, push hands, fighting etc. to be a teacher; you also have to learn how to teach. You have to leave the limited path of your own journey to see the whole landscape and appreciate the many ways students can travel through it. In doing this, you gain a greater insight into the magnitude of the training itself and of the genius of the thousands of teachers who contributed to it. I am a bit fearful of embarking on this project, which would include videos and writing, because I don’t really have the time for it. But I think it could make a positive contribution and will be worth pursuing even if I accomplish only a little of it. In my book, “Movements of Power”, I introduced this subject in the last third of the book. I will also be putting up some videos about how to teach a Tai-chi form on our youtube channel “zookinesis49”. I would appreciate your comments about whether you think this will be a worthwhile project. I am going through my old archival footage and finding gems of Tai-chi masters demonstrating their skills. The videos are going up on our youtube.com channel which is called zookinesis49. Plug in zookinesis49 into the search bar. Here is an example of my teacher, William Chen, performing his Yang style form with voice over. It is very old footage and the video quality is not the best. But it is really worth watching. I have been asked to recount my experiences of studying with Tai-chi-Chuan Grandmaster William C. C. Chen in the 1970’s. When I first saw his form, its fluidity and lightness amazed me and I knew I would continue studying this art for the rest of my life. He began each class doing the entire form once through. I remember one particular time when he was moving so beautifully that I had to stop and step to the side to give him my full attention. I noticed that none of the other students saw anything unusual in Master Chen’s movements. In fact, the other students never really watched him doing the form. They were always in their own world. Master Chen peeked around at the students at one point and saw me watching him and he laughed under his breath. I asked him later what he was doing differently but he said he was just doing the form as usual. In another case he was trying to get me to relax when he kicked me in the gut. I couldn’t relax and always tensed up. At the end of the class we were all in a tight circle listening to Master Chen and he said, “When you kick, you have to kick like this” and he kicked me right in the gut. Of course, I wasn’t expecting it so I was relaxed. He turned to me and said, “Oh, sorry, I didn’t see you standing there”. At this time I owned an animal importing company and tried out what I learned with the animals. Then I took what I learned from the animals and tried it out in the class. From time to time I brought in an animal to show Master Chen. When I brought in a tarantula, I put it right onto his arm to see what his reaction would be. He just calmly watched it walk around on his arm and said it was “cute”. On my first day of fighting class, he had me punch him in the face to get the feeling of punching (I was wearing boxing gloves). I was hesitant to punch him in the face as his only protection was little pieces of paper towels curled up into his nostrils. He insisted that I continue punching him and urged me to hit harder. After about 30 punches, I stopped and he asked me why I stopped. I explained that my wrists and arms were hurting. My interest was not to learn fighting but to learn for health purposes. But Master Chen insisted that I take at least two months of fighting classes. At the end of the two months, Ed Scott (one of his instructors) punched me into a corner and kept punching. I hid under my arms and peeked out hoping to get Master Chen’s attention to deal with this situation. Master Chen was watching us but he was laughing. My only hope was to wildly try to punch back and then Ed backed off (not that he really had to. My punching wasn’t very good at that time). But something snapped in me and from that moment on I loved sparring. I continued going to sparring class. The emphasis of his training was on allowing force to flow through the body while using minimal movement. He brought in a simple hygrometer – a bowl half filled with water, with a sheet of rubber stretched out on the top. A hollow glass tube pierced the rubber sheet and went into the bowl. When he pressed down on the rubber sheet, the water shot up the tube. He explained that when you step down you should feel as if you are stepping on a rubber ball. The compression of the ball creates an energy which shoots up through you. It is as if you are the hollow tube. Before fighting, he would tell us a story which seemed to be leading to a lesson. It was hard to understand him at that time as his accent was thicker than now. So we strained to understand him. Then when he got to the conclusion, his “lesson” seemed to have nothing to do with the story. He immediately paired us off to spar. But our heads (at least mine) was spinning with confusion as to what he was getting at with the story. As I sparred, my mind was all bound up and I found I could spar much better. Did he confuse us on purpose? I don’t know. He always told us to ask him questions, but in all the years I went to his classes I don’t remember anyone asking him anything. I always came in prepared with at least one question. It made me have to analyze what he had taught us. Most of his students were from the city and didn’t have cars. I came in from Long Island. So I drove him home after the classes. There I could ask him lots of questions. He once told me about the time he tried to get into a parking space. Another car tied to swerve in to get the space. Master Chen and the other guy got out of their cars. There was an argument. Master Chen knocked the other guy down, who then ran back to his car and drove away. His studio at that time was on 23rd Street, near 7th Avenue. The floors were marble and the air conditioning didn’t work. There were no windows. It must have been 120 degrees in the class during the summer. After fighting class I felt the punches to my head for a full day, as if someone were still punching me. We always started sparring by punching each other in the head a few times to warm up. I remember that when “Big Bob” and Ed Scott (both over 6 feet tall and around 250 pounds) punched each other in the head to “warm up” it lasted about 10 minutes. They would pound each other without protecting themselves to get used to being hit. (In those days we didn’t wear headgear). The sound of their poundings were so loud that you couldn’t hold a conversation until they finished. The walls of the studio were covered with quarter inch paneling (no sheetrock). If you were thrown against the wall during push hands, you hoped you would land between the studs, in which case the paneling bowed in, rather than directly onto the stud. Priscilla had her Amway storehouse in a little room off the entrance hall and would keep the students supplied with soap and other products. Right after that room was a little counter and behind that Master Chen’s office. At a certain point (I think in the early 1980’s) I stopped attending class. I had moved further out on Long Island, so the trip was difficult and had taken on other responsibilities such as writing my books. After a few years, I visited Master Chen. I walked into the studio and up to the counter where he was looking down at his paperwork. He looked up and just started talking to me as if we had been in the middle of a conversation. His fighting was very quick and evasive. At a certain point I realized that if I aimed for where he was I would never hit him. So I learned to strike to where I thought he would move to and was much more successful in getting my strikes in. His form always seemed to me to be like dripping water. He almost moved into position and then relaxed to move into the next position. Yet you could see that his energy completely finished the move even if his body “understated” the move. If you could divide your mind into two parts – one following the body’s movements, and the other to the natural completion of the momentum, you could understand the way Master Chen “blended” the two in various ways. That is what taught me the most. I analyzed the components of his form both on a body mechanics level and an energetic level. That allowed me to understand what he was saying when he tried to explain the principles. So when I practiced push hands in class for example, I tried to extend the “mind” into the part of the partner’s body which had the least awareness or the least fluidity and then let the mechanics of my body create momentum to move along the pathway that my intention laid down, leading to that vulnerable part of the partner’s body. The expansion of my breath then caused the push itself. I think that you cannot just take what Master Chen says and try to duplicate that within yourself. You have to see him, analyze the role of body mechanics, mind and energy and apply it in innovative ways so that it works for you. I think that is what he expects of you. He used to say that he is just interested in body mechanics, but I notice on the workshop dvd that he is now talking more about mind and energy. I don’t think you can separate mind and energy dynamics and only work on body mechanics and hope to gain the kind of skill that Master Chen has. He also seems to concentrate on a different aspect of Tai-chi-Chuan in each decade. You need to know the whole range of his teaching from the beginning when I studied to now, to get an appreciation of the whole. I wish he had done a workshop dvd each decade so we could see the evolution of his approach to teaching. I should also mention that I originally studied with one of his students, Herb Ray, who also had this analytical approach, taking apart every nut and bolt of the training in excruciating detail. The emphasis on how I teach now is identifying and letting go of all unnecessary behavior patterns so that there is no excess of movement – that the goal is accomplished with the movement of energy and the minimum movement of the body. I think this is the essence of Master Chen’s training. He once wrote me a saying in Chinese (which I still have) that Master Chen, Man Ching taught him. “Tai-chi means not moving arms. If it is moving arms, it is not Tai-chi”. This means of course, not moving arms by themselves. At least that’s what he told me it means. I don’t speak or read Chinese.